PHOTOGRAPHING THE PRIZE WINNING COW. This finely turned out horse drawn transport was used at the 1977 Royal Norfolk Show to take the prize and the committee members to the family group (cow and calf category) competition. As you can see it was lovely summer’s day. I remember one prize given day very well as I earned £20 for photographing it! £20 was a good sum of money back then. I had decided, on a whim, to go to the Show, and took my camera and equipment box with me. It was a SLR camera – not a particularly good one, an East German version of a Leica, a Praktica- but I must have looked the part because of my box of equipment. I was seized on by the Colman’s PR girl (Colman’s had donated the prize). “The company photographer has not turned up; could you do the honours, paid of course?” Naturally I agreed. First I got a trip round the ring inside the Colman’s Mustard Omnibus. We waited to one side while the judging took place. Then I had to get out and hop round with my camera, trying to look authentically professional, photographing the winning cow and calf. Luckily there was a real press photographer there too, and I could imitate the way he squatted down to get suitable low level views. I must have snapped the bus as well; that was one slide I did keep for myself – and here it is! Then it was back on board the bus to leave the ring again. It only took 10 minutes at the outside – a very well paid 10 minutes work. In Royal terms 1977 was a significant year, and Colman’s threw in a Silver Jubilee mustard pot and tin of mustard into my remuneration as well! It only remained to get the film developed and send off the slides. I don’t remember anything else about the Show but I remember my unexpected omnibus ride very well. I have never been to the Royal Norfolk Show since. Nothing could beat that day in June 1977, and I decided to go out on a high. 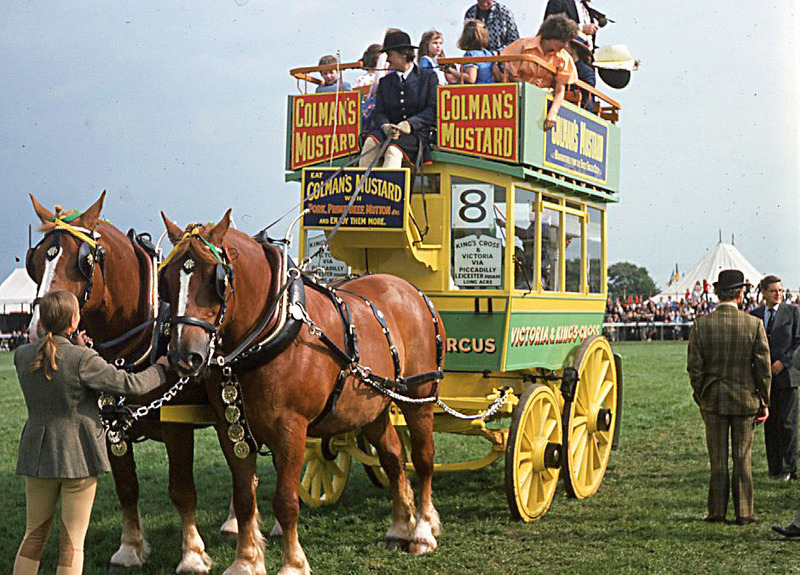 I don’t suppose that the omnibus advertised Colman’s Mustard when it was built. Today the Colman’s mustard omnibus is kept at the Hillside Shire Horse Sanctuary at West Runton in North Norfolk, and it no longer goes on trips with a set of shire horses. (Note of 10/10/2014: This information comes from Chris Woodyard, the Caretaker). 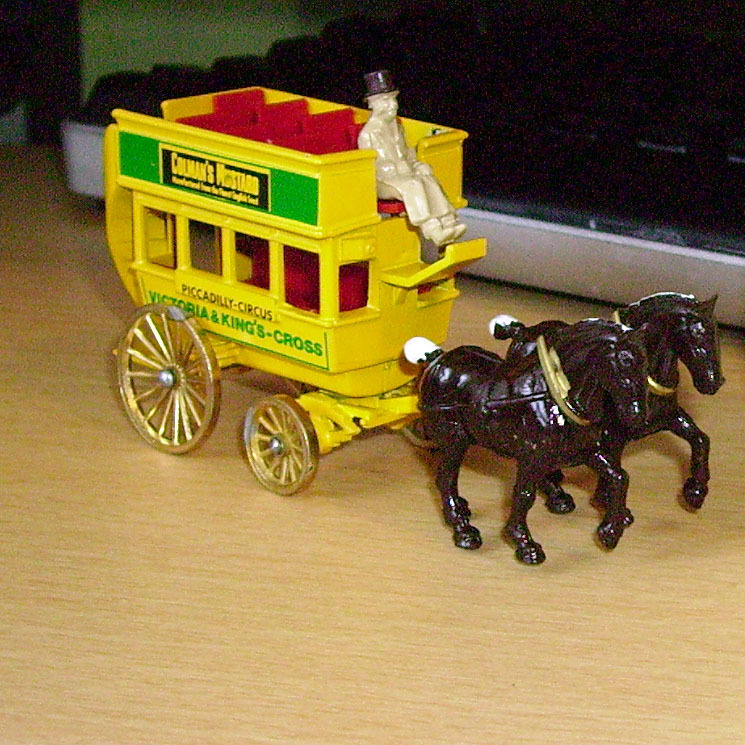 There is a Lledo DAYS GONE model of this omnibus- see the picture to the left. What else can I tell you about Colman’s mustard? I know that the collection of silver mustard pots which Colman’s built up over many years was sold and dispersed in about 1995. The remnants of Colman’s is shortly to abandon Norwich altogether, and I will no longer have to purchase it as a loyal person of Norwich birth; I will have no qualms about buying French mustard which I much prefer.